This was an epic year for fashion moments. Celebrities have been bringing their style A game for the past 12 months, and now it’s time to pay them the credit they deserve. From a certain newlywed who now goes by the last name Bieber (just guess) to the breakout pop singer on everyone’s lips, we’ve compiled a list of our favorite well-dressed stars from the past 365 days. Trust us—it wasn’t easy to narrow it down, but these 10 were among the clear standouts. Curious to know who made the cut? After a whirlwind wedding that captured the attention of the world and a pregnancy announcement, Meghan Markle had quite the year, but it was the plethora of royal outfits the duchess wore that we couldn’t shut up about. After all, the Meghan Markle effect proved to be the most powerful fashion influencer, driving a jaw-dropping number sales each time she wore something. Adwoa Aboah, Bella Hadid, and Rosie Huntington-Whiteley also had a standout year, stepping out in 2018 in their best looks to date. But that’s just the beginning. Keep reading to see the rest of our best dressed celebrities of the year. 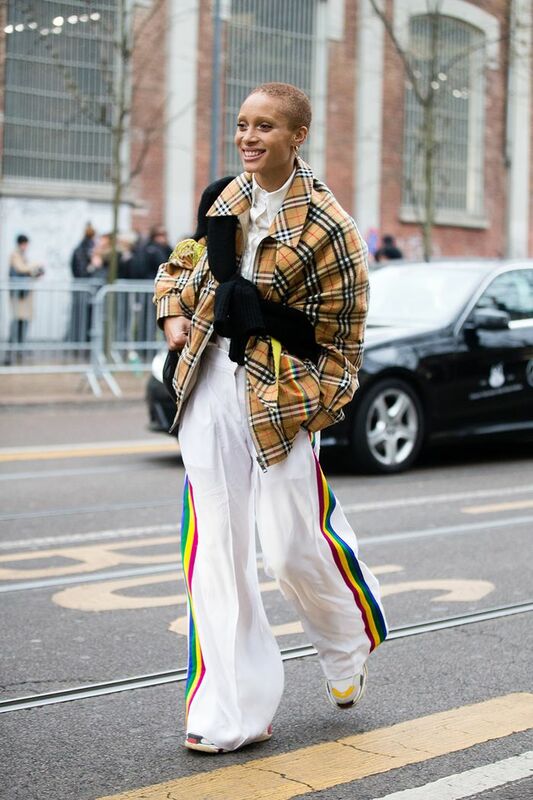 If you poked your head into Adwoa Aboah's closet, you'd find it teeming with things like bucket hats, creepers, and loads of Burberry's signature checkers. The model has been a fixture on runways for seasons now, but it's her street style that's really broken through this year thanks to her many colorful, flamboyant outfits. Bella Hadid was the celeb on everyone's lips this year as she stepped out in increasingly cool outfits. We could always count on Hadid to break in the most cutting-edge trends, first easing us into bike shorts early on in the year and then more recently getting behind the cardigan trend in a big way. The Who What Wear offices couldn't stop buzzing about Dua Lipa this year. The breakout pop singer behind summer hits "No Rules" and "One Kiss" showed off her A+ style moves all over her Instagram. From Adam Selman to Orseund Iris, Lipa's wardrobe is chock-full of the buzziest up-and-comers in the game right now, further solidifying her as the pop star of the year. RHW is unwavering in her approach to classic style with a minimalist bend, and for that we applaud her. This year, the model/entrepreneur served up killer look after killer look (as she always does). This was a standout year for the L.A.-born, New York–based model. Between walking in some of NYFW's major runway shows to fronting campaign after campaign, Elsesser is making waves in the industry and creating a new standard for body inclusivity. For these and so many more reasons, she marks the incoming of a new generation of fashion icons. Ever since Hailey Baldwin's engagement to Justin Beiber and their subsequent marriage, the two have been inseparable, proving to be one of the most stylish celebrity couples right now. With so many spottings lately, we couldn't help but applaud Bieber on her winning sneaker outfits. Whether she's sporting her statement-making Louis Vuittons or keeping it classic with her Adidas Continentals, her sneaker outfits are always inspirational. Every time Meghan Markle wore anything, the world lost it, so much so that her all-powerful influence has been dubbed the Meghan Markle effect. She's known to drive as much as a 1000% increase in sales after she emerges (no doubt looking flawless as a princess does) in a given garment or brand. Jennifer Lopez has long been an icon, but 2018 saw some of her best looks yet. Despite the constant change of trends throughout the years, Lopez’s style always has a wow factor that we’ve come to love and look forward to every time she hits the red carpet or strolls the streets of L.A. or NYC. Chopra's had quite the year, culminating in her whirlwind wedding to Nick Jonas. From start to finish, 2018 showcased the very best of Chopra's polished, sleek style. In a sea of ever-fleeting trends, Chopra continued to delight us with her consistently golden ensembles. The 18-year-old actress and activist is best known for her roles on the TV shows Black-ish and Grown-ish but beyond that is regularly cited as having the most potential in Hollywood to define and redefine the next generation of film and television. Oh, and did we mentioned how next-level her red carpet style is? Mark our words: She's going places. Next, see which fashion items dominated our Instagram feeds in 2018.